Nasa has published a new book called ‘Earth’. It features 168 pages of dramatic pictures of Earth taken from satellites in space. This picture shows how weather shapes the way we see the world. These peaks are from the Islands of the Four Mountains in Alaska, in the USA. 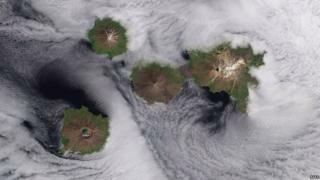 They are actually the upper slopes of volcanoes rising from the seafloor. The book is broken up into different categories: atmosphere, water, land, ice and snow. 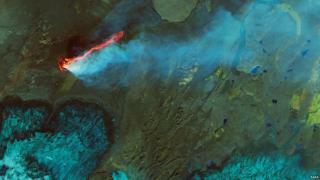 This is the Holuhraun Lava Field in Iceland. The picture has shortwave infrared, near-infrared, and green light. to show the difference between the land, water and lava. Infrared pictures help scientists measure how fast lava pours out of the Earth. 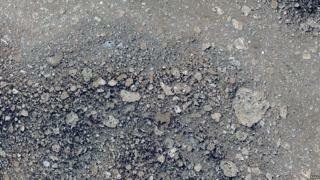 It also helps them find lava flows and map how the eruption evolves. There are 69 pictures in the book which is designed to give the reader a bit of knowledge about the earth as well as some fantastic views. 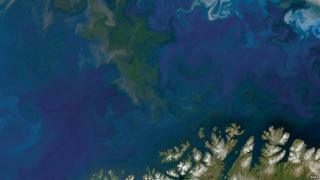 This is the surface water of the Barents Sea in the north of Norway and Russia. the swirls were created by different types of plankton mixing in heavy weather conditions. “The spectacular images in this book remind us of the majestic beauty of our world,” said NASA Scientists Lawrence Friedl. 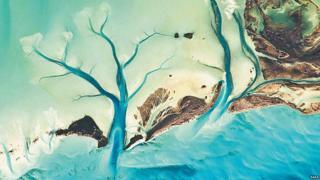 Tidal Flats and Channels in Bahamas - taken by the International Space Station and gives an interesting view of the tidal flats and underwater channels. 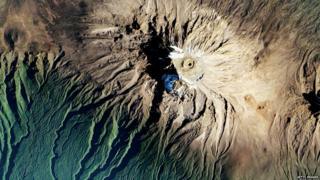 Mount Kilimanjaro in Tanzania is known being the tallest mountain in Africa. It's capped with snow and ice. The mountain rises from the hot, dry Savanna, and through rainforest to a rocky and icy summit. The Tsauchab River bed in Namibia in Africa is a famous landmark but not many people have ever seen the river flowing with water. 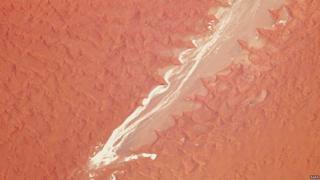 Over millions of years red dunes have formed giving the area its striking look. Here different types of ice form in the Caspian Sea, which stretches from Kazakhstan to Iran. The Caspian Sea is the world's largest inland body of water and for 20 years Azerbaijan, Iran, Kazakhstan, Russia and Turkmenistan, which surround it, have disagreed over whether it is a lake or a sea. Like many lakes, it does not feed into an ocean, but it is sea-like in its size and depth. 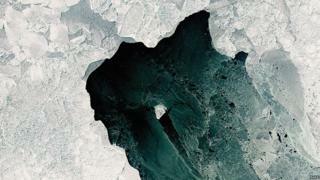 Talking about the book, Nasa said: “We hope these images inspire everyone to explore, understand, and appreciate the planet we call home.” This is the Manning Island and Foxe Basin in Canada - the picture shows a set of islands and a mixture of ice in Foxe Basin, in the shallow northern reaches of Hudson Bay. Foxe Basin sea ice is known for having an unusual brown colour because of staining from bits of rock from rivers. Nasa at 60: Where did Nasa come from?